The Owens Foundation for Wildlife Conservation, Inc. raises funds from individual donors, charitable foundations, corporations, private organizations, civic clubs, and other groups with an interest in conservation. U.S. Tax-Deductible Donations: U.S. based tax deductible donations may be made to the Owens Foundation (IRS 501(c)(3) tax exempt identification number 58-1749339)at P.O. Box 870530, Stone Mountain, Georgia 30087 USA. Donations from outside the US are also gratefully accepted. See below for information on foreign currency conversion. Thank you for donating. There are no small donations. Every penny is a plus in protecting wildlife, their habitat and the people who live near them. STOCK DONATIONS: Donations of stock can also be accepted by the Owens Foundation. This type of donation has the added advantage of saving the donor capitol gains tax. DONATIONS BY BEQUEATH - LEGACY PLANNING: Donations by bequeath are also greatly appreciated. Stating in your "Will" that you elect to set aside a designated portion of your estate for the Owens Foundation for Wildlife Conservation allows you to impact conservation far into the future. Simply list the following information in your estate document: Owens Foundation for Wildlife Conservation, Inc., 501(c)(3) tax-exempt Federal Tax ID 58-1749339, P.O. Box 870530, Stone Mountain, Georgia 30087 USA. You can also designate the Owens Foundation as beneficiary of Annuities, Life Insurance Policies and Retirement Plans. FOREIGN CURRENCY DONATIONS: The Owens Foundation does not have tax exempt status outside the United States, but all donations are gratefully received. New banking restrictions make it expensive to convert foreign currencies. US banks will not convert a check valued at less than US$200 and US banks charge US$60 per check to convert foreign currency donations. 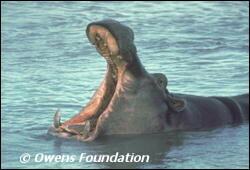 Therefore, to obtain the most from any conservation donation, please try to convert your donation to US dollars. Most post offices and banks around the world sell money orders in US dollars for a small charge. Credit cards are another good option. DONATION BY CREDIT CARD: Donations from inside and outside the US can be made by credit card through our web site's "Donate Now!" button at the top of this page. Any foreign currency donation by credit card will be converted to US dollars by the credit card company. Note that 5% of your donation goes to the credit card processing company, Network for Good, to cover their expenses. COMPANY MATCHING DONATIONS: Many companies offer to match donations made by their employees and retirees to accredited 501(c)(3) tax-exempt, non-profit organizations such as the Owens Foundation. Please check to see if your employer offers this option. NOTE: There may be no use of the names 'Mark and Delia Owens' or 'Owens Foundation for Wildlife Conservation' for fundraising or other purposes, and no fundraising activities may be undertaken on behalf of Mark and Delia Owens or Owens Foundation for Wildlife Conservation, without prior consultation and written consent from Mark and Delia Owens. If you would like to assist in our fundraising efforts, please contact us. 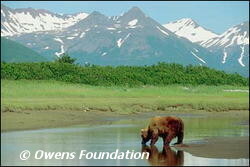 TELL OTHERS about the Owens Foundation. Send the names and addresses of any interested individuals to the Owens Foundation. CONTACT INDIVIDUALS OR ORGANIZATIONS in your area that would be interested in sponsoring a lecture by Delia and Mark Owens such as your local zoo or zoological society, natural history museum, universities, conservation, or education groups. DON'T BUY OR WEAR IVORY (no matter how old). This only encourages others to use elephant ivory for ornamentation--which encourages poaching. Express your disapproval to the managers of stores in your area that sell ivory or other elephant parts. Ask others not to wear or buy ivory. Amazon.com links on this site: You can generate income for the Owens Foundation by linking to Amazon.com through the OFWC home page web link. Five percent of every purchase you make through our link will be returned to the Owens Foundation. SCHOOL, MEDICAL AND CRAFT SUPPLIES FOR NORTH LUANGWA: School, medical and craft supplies are always greatly needed an appreciated in the rural villages near North Luangwa in Zambia. School Supplies: Please see our Sister School page for details on school supplies. Medical Supplies: The Traditional Birth Attendants trained by Delia and Mark Owens and Hammer Simwinga to serve the remote villages are in great need of the following supplies: Betadyne disinfectant, antibiotic cream or ointment, exam gloves, bandages, gauze pads and tape, antibiotic soap and ziplock bags. If you can donate such items, they will make a big difference in the lives of the people of the area and therefore the wildlife. Craft Supplies: Donations of cloth, thread and sewing notions will be greatly appreciated by the Women's Sewing Clubs in various villages near North Luangwa. Calculating Postage: You can go to The U.S. Post Office for shipping to Zambia to check the potential cost of an "M" Bag (books) or non-book shipment such as crayons, pens, penciles, medical or craft items, etc. In 2008 the USPS eliminated all surface rates for shipments outside the US. All shipments are now designated as Airmail. Price have more than tripled so be very mindful of cost when you collect items to ship and check the USPS link above to check costs. Customs: Designate School Supplies as Education Materials, Medical Supplies as Hygiene Supplies and Sewing Supplies as Craft Supplies on the custom declaration and check them as a gift. Airmail is now the only shipment option and is expensive - in spite of the fact that there is no airmail from Lusaka to Mpika. Shipments can take months to arrive - but don't let that deter you! Packaging: Use STURDY cardboard boxes. IMPORTANT: Tape with at least two strips of duct tape around each facet of the box. Cover all outside edges of the duct tape with heavy 2 inch clear plastic tape or the duct tape will roll and become sticky and cause a huge problem. However, with the clear tape over it - it makes a nearly waterproof and indestructible box. SUPPORT A COMPLETE BAN ON COMMERCIAL IVORY SALES: In 1989, in the wake of the ten year firestorm of elephant poaching which wiped out half of the world's elephants, the United Nation's organization, CITES (Convention on the International Trade in Endangered Species) established a treaty banning any commercial trade in elephant ivory that was signed by the majority of member nations. Some of those countries and individuals with much to gain from the sale of ivory have been lobbying to overturn the ban. Delia and Mark Owens' 10 years of elephant research data from North Luangwa National Park in Zambia clearly shows that the CITES ban on ivory sales is the only thing standing between the remaining elephants in North Luangwa (and in most of the other elephant range states) and extermination by poachers. Before the ban, the price for elephant ivory was as high as $200 per pound. After the ban went into effect, the price dropped to as low as $2.00. There was a greatly reduced reward for the dangerous act of killing elephants. 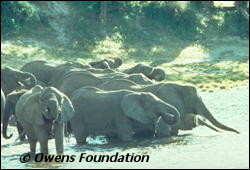 In North Luangwa, the number of elephants kill by poachers dropped from as many as 1,000 a year to under twenty. Some countries, such as Botswana and South Africa have populations of elephants which are confined to ever diminishing wildlife reserves. These countries have resorted to culling (shooting) elephants to confine their populations within the shrinking national parks. Zimbabwe, Botswana and Namibia have been allowed by the CITES secretariat to sell portions of the elephant ivory that they have held in 'stockpiles' for many years. This one time sale of ivory sparked increased poaching of elephants all over Africa and Asia. In 2002 CITES voted to allow Botswana and Namibia to sell stockpiled ivory IF it could be proved that this potential sale did not increase poaching of elephants. The attempt to quantify and qualify poaching statistics is on-going. It is very difficult to confirm the inflow and outflow of ivory from these stockpiles. Experts understand that any legal sale in ivory will stimulate an illegal trade and therefore, are against the reopening of any trade in elephant ivory. The most common rationalization for allowing any legal trade in ivory is that the proceeds from this trade will be used to fund conservation efforts in the sponsoring country; however, there has been little proof that funds from ivory sales have been used for conservation work. You may also write to the president, your Senators and Congressman, and the U.S. Fish and Wildlife Service expressing your support for the United Nations' CITES (Convention on International Trade in Endangered Species) international ban on the trade of ivory and all elephant parts including ivory, hides, hair, tails, feet and ears. The U.S. Fish and Wildlife Service represents the U.S. government at the CITES meetings. In the past its officials have seriously considered "down-listing" elephants on the endangered species list to allow a limited trade. But any trade in elephant parts encourages a market and leads directly to poaching. For individuals outside the US, please locate the governmental agency in your government that acts as the CITES representative and voice your support for a total ban on commercial sales of elephant ivory and other body parts. SUPPORT A CONTINUED STRONG ENDANGERED SPECIES ACT: Also, Congress is threatening to weaken the U.S. Endangered Species Act, severely diluting the protection given to both domestic (bald eagle, wolves, grizzly, etc.) and foreign endangered species (elephants, tigers, rhinos, etc.) You can help educate our elected officials that we must have both the CITES ivory ban and a continued strong Endangered Species Act. It is critical that our elected officials know that while supporting the endangered species act, relief should be provided for communities whose economies are negatively impacted by its enforcement. You can write your Senator and Congressman as well as the president. PETITIONS: Collecting petitions including full statement of the purpose of the petition and full name and address of each signatory - in support of CITES and the ESA can be very helpful. Please send any petitions to the Owens Foundation for distribution to appropriate representatives. Lions: Experts agree that the number of wild lions in Africa is diminishing at an alarming rate. Trophy hunting of lions targets the biggest and strongest individuals leaving the less fit individuals to reproduce. This weakens the genetic fitness of the lion population. The number of mature male lions is declining. The lions of Africa need time to recover their numbers and to allow individuals to grow to full maturity. Botswana has banned lion hunting to allow the current population to mature and stabalize. This ban needs to be continued. Diamond Mines: The government of Botswana has opened the fragile Kalahari ecosystem to potential diamond mining. This arid environment cannot survive the insults inflicted by large scale open pit mining operations. This ecosystem has developed over eons but it can be destroyed in a matter of years. Please share your concerns with the government of Botswana and tell them that you will be forced to choose another tourism location if they do not protect the Central Kalahari Game Reserve. Bushman Relocation: We believe that it is wrong to force the removal of hunter-gatherer Bushman from the Kalahari Desert where they have lived in harmony with the land for centuries. Urge the government of Botswana to give traditional Bushmen the consideration and dignity that they deserve. On issues regarding the Kalahari, you may write to president Khama and thank him for the suspension of lion hunting and express your support for the continued protection of the priceless Central Kalahari Game Reserve, her people and wildlife. ROCK CREEK SILVER MINE - MONTANA, USA: The Rock Creek Silver Mine poses a new and deadly threat to the integrity of the Cabinet-Yaak Mountains of northwest Montana. Since it was enacted, the General Mining Law of 1872 has handed over huge tracts of public land to mining companies for next to noting. Now Revett Silver Company of Spokane, Washington plans to spend the next thirty years digging a huge silver mine in the Cabinet Mountains near Noxon, Montana. The mines - the first ever to be allowed in one of our nation's wilderness areas - will discharge 3 million gallons of effluent a day into Lake Pend Oreille and the Clark Fork River, one of the most pristine watersheds left in the western US. This mine will undoubtedly kill one of the last five grizzly populations in the lower 48 states plus endangered bull trout and other threatened species. It will also have a negative impact on human water sources. The US Forest Service claims that its hands are tied by the General Mining Law and gave the Rock Creek Silver Mine the approval to proceed. However, a reform bill is before Congress that would grant the Secretaries of Agriculture and the Interior veto power over mining projects, and exhort these officials to protect sanctuaries like the Cabinets. You can contact your Congressman and the White House and voice your support for the revision of the General Mining Law of 1872. *You may contact your Senator by linking to <www.senate.gov/contacting/index.cfm> which will provide you with mailing address, email link and phone contact information. Or you may link to The Office of the Clerk for an alphabetical list of all Congressmen and their contact information at <clerkweb.house.gov> You can link directly to the email of each congressional representative from this site. Or you may link to <www.house.gov/writerep> where you can send an email directly to your Representative. BAN ON GRIZZLY BEAR HUNTING IN BRITISH COLUMBIA, CANADA: Premier Ujjal Dosanjh of Canada announced a three year moratorium on the hunting of grizzly bears in British Columbia effective February 8, 2001. The government wanted to give grizzly bear experts time to accurately access the number of grizzly bears in BC as current grizzly population numbers are estimates based on questionable models. The moratorium was particularly good for the grizzlies of Selkirk where the population is split half in Northern Idaho/Eastern Washington State and half in Southern British Columbia. Though there has been no hunting of grizzlies in the US, the bears routinely cross back and forth between Canada and the US and could be legally killed by a hunter when they cross into Canada during hunting season. Current Premier of British Columbia, Gordon Campbell, reinstated grizzly bear hunting. Please voice your support for a ban on the hunting of grizzlies. This is a critically important issue for the conservation of all grizzlies. Grizzly Bears are officially classed as threatened or endangered across most of their shrinking range in Canada. Over a third of grizzlies killed are females, some of whom are mothers. While it is illegal to deliberately kill a mother bear with cubs, it inevitably happens, leaving orphaned cubs to starve. According to conservation groups in Canada, British Columbia has never carried out a reliable population census. Instead it sets "harvest" quotas using a deeply flawed estimation method, that according to one of their own Senior Habitat Biologists substantially overestimates the grizzly bear population. Between 1990 and 1998, 2,631 grizzlies were reported as having been 'sport-hunted'. That is an average of nearly 300 grizzlies shot per year. A recent opinion poll shows that the majority of BC citizens oppose the grizzly bear hunt. The grizzly has been driven from 99% of its former habitat in the US and from a quarter of its range in Canada. British Columbia is the heart of the remaining population.